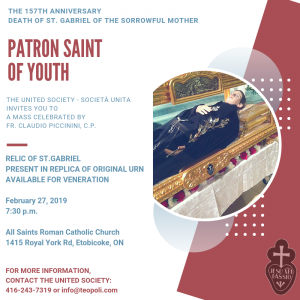 The United Society – Società Unita invites you to the Celebration of Holy Mass to commemorate the 157th Death Anniversary of St. Gabriel of the Sorrowful Mother. The Mass will be celebrated by Fr. Claudio Piccinini, C.P. with the relic of St. Gabriel present in the replica of the original urn available for veneration. Please do not miss this opportunity to be in the presence of a Saint not only for our personal enrichment, but also for the betterment of our youth and entire family.